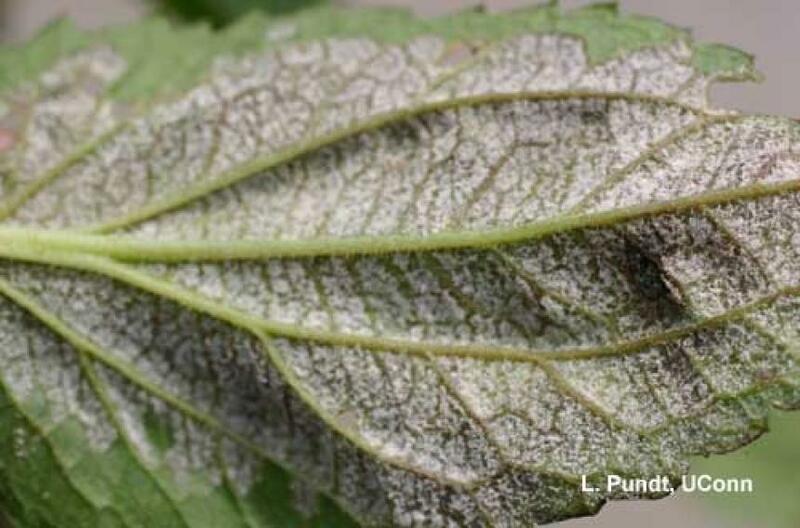 Downy mildew diseases can cause serious losses in many floriculture and greenhouse crops. In recent years, new downy mildew diseases have been discovered on coleus, basil, and garden impatiens. 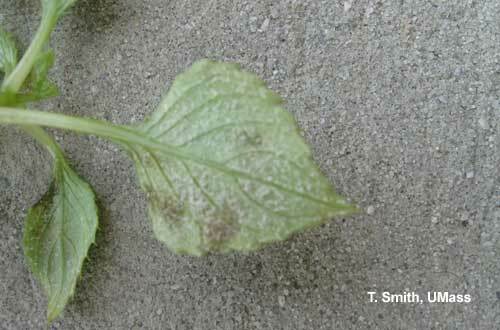 Downy mildews present a challenge to growers both because they can be present but not obvious, and because they are difficult to control with fungicides once established. The pathogens are very different from powdery mildews- they attack different plants under very different environmental conditions, and are controlled by different classes of fungicides. Downy mildew diseases are caused by oomycetes, a group of fungus-like organisms that also includes Pythium and Phytophthora species. Most of the downy mildew fungi are very host specific and infect only one plant family. Pathogens include species of Peronospora, Pseudoperonospora, Bremia, Plasmopara, and Basidiophora. Downy mildews infect almost all ornamental plants as well as some indoor plants. Greenhouse crops reported to have downy mildew diseases include snapdragon, Salvia, alyssum, pansy, sunflower, rosemary, Primula, Osteospermum, Impatiens walleriana, coleus, statice, Verbena, ornamental cabbage, basil, and Cineraria. Perennial hosts include Aster, Buddleia, Coreopsis, Geranium (not Pelargonium), Geum, Gerbera, Lamium, Delphinium, Veronica, and Viola. 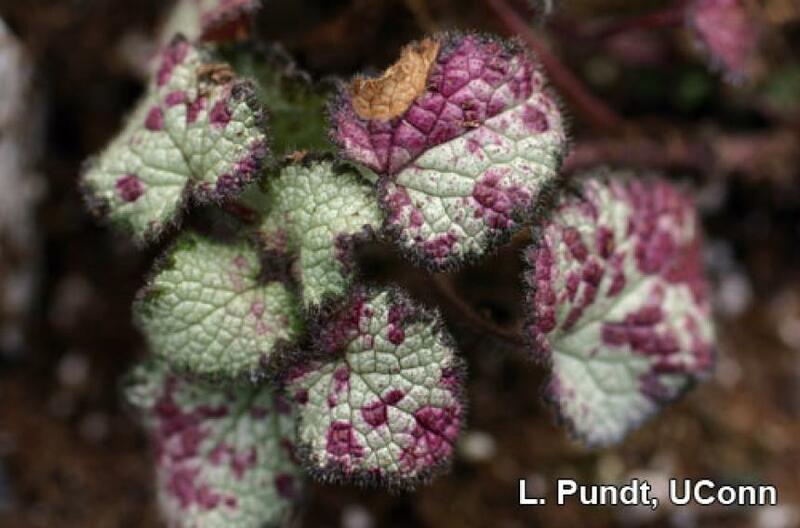 For more information about downy mildews of basil, coleus, and impatiens, please see individual fact sheets. Downy mildews begin as yellow to light green, irregular leaf lesions that may become purple to dark brown and are delimited by leaf veins. Under humid conditions, the fungus sporulates on leaf undersides, producing a downy growth which may be white, tan, gray, or purple. Downy mildews vary in aggressiveness, and symptoms will vary among host species. As the disease progresses, lower leaves often wither and fall off. 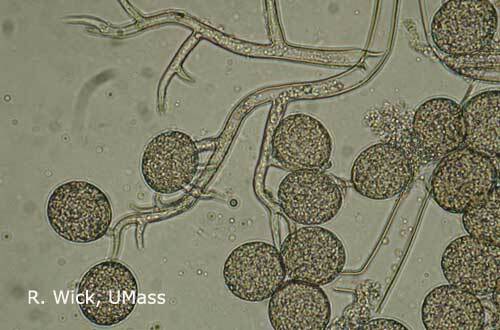 The fungus grows both locally and systemically and it can escape notice until conditions are right for sporulation. Systemic symptoms can include stunting, leaf distortion, epinasty, shortened internodes, and a decrease in the quantity and quality of flowers. Downy mildews reproduce through special structures called sporangia that develop on leaf undersides. Air currents and splashing water dislodge these sporangia and spread the pathogen to nearby healthy plants. The period between infection and symptom development can vary from days to weeks and is dependent largely upon environmental conditions. Some downy mildews produce long lasting survival spores called oospores that can persist in the soil indefinitely. Others may survive in weed hosts near greenhouses. Downy mildews may also be seed-borne. Downy mildews thrive under the cool, wet conditions of spring and fall. The pathogens need wet leaves and high relative humidity (greater than 85 %) to cause disease; under these conditions, disease can occur rapidly and is difficult to control. Cultural management practices for downy mildew diseases consist of excluding the disease from the greenhouse, managing relative humidity, and strict sanitation. Plants should only be purchased from reputable and trusted sources and should be thoroughly inspected before their introduction into production areas. Keep relative humidity below 85 % to inhibit sporulation on infected plants and stop germination of spores on healthy plants. This can be done by venting and heating, which fills the greenhouse with warm, drier air. The use of fans in greenhouses improves horizontal air flow and prevents cold spots where condensation develops from occurring. The density of the plant canopy should be reduced by spacing plants to allow for maximum air circulation and sunlight availability. Scout regularly for early symptoms of the disease. Diseased plants, infected debris, and soil should be promptly removed and destroyed. Asymptomatic plants immediately surrounding diseased plants should also be removed and destroyed. Control weeds inside and outside of greenhouses, as they may also serve as hosts for downy mildews. Avoid using downy mildew- prone plants in ornamental beds near greenhouses. Growing downy mildew resistant cultivars is advisable; however, very few of these are currently available. Fungicides will be ineffective unless used in conjunction with good cultural management practices. Fungicides should be applied preventively for maximum efficacy. The highest levels of control are obtained when fungicides are applied preventively. Many products which give excellent control preventively provide little to no control when used as curatives. M. Bess Dicklow, 2013; Revised by Angela Madeiras. Photos by R. Wick, L. Pundt, T. Smith.